More specifically, the USPSTF is recommending against supplements of Vitamin D in daily doses of less than 400 IU (international units), and calcium in daily doses of less than 1,000 milligrams for post-menopausal women. 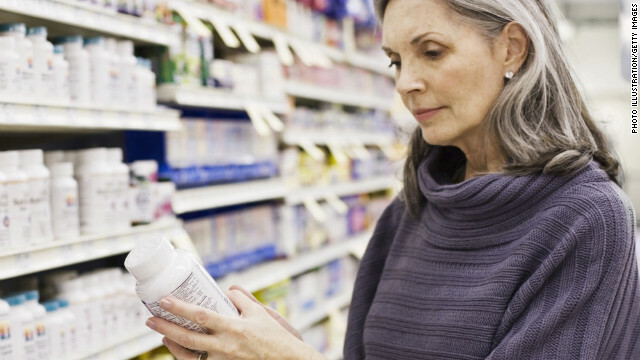 Doctors currently recommend these supplements for women to prevent fractures; approximately 56% of women aged 60 years and older take supplemental vitamin D, and 60% take a supplement containing calcium, according to the USPSTF report. The report was published in this week’s edition of the Annals of Internal Medicine journal. The task force found evidence that Vitamin D and calcium supplements increase the risk of developing kidney stones in this population, and insufficient evidence to show that the supplements reduce the risk of fractures. Basically it boils down to this: “Don't take modest doses, they don't do any good,” says Dr. Virginia Moyer, chair of the USPSTF. More research is needed, Moyer says, to determine whether higher doses of Vitamin D or calcium would prevent fractures in older men or women. She says the task force will be looking in the future at whether doctors should be screening for Vitamin D deficiencies. The USPSTF’s recommendations don’t apply to those who are prone to falling, according to the report, or those who have a history of fractures, a documented Vitamin D deficiency or a diagnosis of osteoporosis. Vitamin D is not actually a vitamin, according to nutrition experts Marion Nestle and Malden C. Nesheim; it’s a hormone produced by the body in reaction to sunlight. “Like other hormones, vitamin D has multiple roles in the body, not all of them well-understood,” the experts wrote in an editorial about the USPSTF recommendations. As such, Vitamin D supplements must be considered a form of hormone replacement therapy, they wrote, and be subjected to similar probes about efficacy, dose and side effects. As we’ve seen with recommendations from this group in the past (think prostate or cervical cancer screenings), there are those that disagree with the task force’s conclusion. “These recommendations fail to recognize the well-established role of calcium and vitamin D in maintaining bone health,” the Council for Responsible Nutrition said in a statement. “If these recommendations are taken to heart, or misconstrued as general recommendations against calcium and vitamin D, consumers could be compromising their bone health and missing out on important other benefits from these nutrients. The Centers for Disease Control and Prevention says African-Americans have the highest rates of Vitamin D deficiency - along with the highest bone density and fewest fractures. Approximately 12% of Mexican-Americans are deficient, while only 3% of non-Hispanic whites are at risk. The Institute of Medicine recommends adults get at least 800 to 1000 mg of calcium daily, depending on their age, and at least 400 IU of Vitamin D. Adults can safely absorb up to 2,500 mg of calcium and 4,000 IU of Vitamin D.
Calcium is most commonly found in dairy products like milk, cheese and yogurt, but it’s also available in green leafy vegetables like spinach and kale. Vitamin D is crucial for helping your body absorb calcium, which is why the nutrients are often talked about together. Vitamin D can be found in fatty fish or fortified foods like cereal and orange juice. It’s also found in sun rays, where it’s absorbed through the skin. One can also ask why after many decades of research we can do no better than this? To me the lack of progress suggests that we need a different approach. If we had stopped eating vegetables a few centuries ago and resorted to using vitamin C pills to prevent rickets, could we have proven that you actually need higher dosages of vitamin C and that other compounds are also necessary? No, because you can only clearly demostrate that you need about 10 mg vitamin C per day to prevent rickets, there are no such clear cut results for the relation between vitamin C intake and other diseases. What perhaps can work is to do a RCT with young healthy people, let them undergo a workout program for a few years and try to see if the placebo group's fitness is significantly worse. There e.g. are some suggestions in the literature that taking 5000 IU/day of vitamin D helps people to recuperate from exercise. Then if 5000 IU/day is the natural dose and it's main role at these higher dosages is for the body to remain in shape, then that will indirectly also contribute to a better health. Calcium in the form of dairy and fortified with vitamin D is DANGEROUS to the body!!! This causes calcifications which are the base to many diseases and tumor growth. Calcium from vegetables (ex. Broccoli, Spinach) have a magnesium balance which helps the body to absorb the calcium properly!! We are NOT baby calves and should not consume dairy which has 2 extra hormones to promote a calf to grow into a cow. research it yourself. ...Calcium with a magnesium balance! After reading the comments here and also the Task Force's publication, I think its important to point out that the absence of evidence is not evidence of absence. Correction: When I wrote "rickets" in my posting above, I obviously meant "scurvy" which is caused by severe vitamin C deficiency. First and foremost, absorption. If we don't absorb what we take, it does end up on our tissues and bones. If your not sure about that just test it out for yourselves. If you put natural vitamin E on one hand and synthetic vitamin E on the other hand you will observe that the natural vitamin E gets absorbed, while the synthetic vitamin E does not. It sits on the hand like a pile of grease. However the subject is Calcium and vitamin D. but the principle is the same. It would take me ten years to tell you the absorption story of calcium. If you know what your doing and you know your body well enough, calcium can be very beneficial. If you don't know what your doing and you really don't know your body that well, best to go to someone that has more than 3 credit hours in diet and nutrition. "Vitamin D... also found in sun rays, where it’s absorbed through the skin." Rofl, I was thinking the exact same thing. The editor that let this get to a published state should be fired. I wonder if Dr. Gupta is aware he is associated with a new line of radical thinking. Vitamin D – its in the sunshine. It is NOT found in sun rays...sun rays synthesize it from cholesterol. However, with everyone taking cholesterol lowing drugs these days.......... see where I am headed? hmmm, this article :N Engl J Med 2012; 367:40-49July 5, 2012DOI: 10.1056/NEJMoa1109617 shows 30% reduction in hip fractures at what they characterize as 'high' >800 iu. LOL, indeed. You mean I can't believe everything I read on the internet? The question at hand is why does CNN let anyone but an educated writer with a sound foundation in the topic get to write an article which is just a mishmash of the original article? I guess CNN has so little respect for its readers and viewers they feel we need science articles dumbed down. Well this was certainly dumb – was it CNN's intent? I can hardly wait for CNN to report on Chicken Little's scientific analysis of the meteor that boomed over the city of Chelyabinsk on Feb 15. So you can finish reading and realize you wasted you time. If I don't take vitamin D in the winter, my elbows will crack open and bleed. Dont know about bones but without it, my skin suffers. Thank you, the wording in that part of the article bothered me as well. It implies that somehow the suns rays magically carry vitamin D through the solar system, from deep within a suns core, where it falls to earth and is picked up and absorbed through the skin. Seems legit! Cholesterol lowering drugs, such as statins, simply reduce the amount of cholesterol produced by the liver down to normal levels. So they should have no effect on Vitamin D levels. This study seems to omit the influence that moderate doses of vitamin D play in alleviating depression and other issues related to the lack of sun exposure. A major reason many people take Vitamin D supplements in some parts of the world. It drives me crazy when studies like these are so narrow in scope, ignoring huge sections of the market that they are making recommendation to. If you are going to start making such wild statements, wouldn't be proper to take the time to do a complete study, rather than look at a single aspect of a products usage and then start making wild recommendations based on that? just asking. I have found that just sitting in the sun for 15 minutes – wherever and whenever it's out – in winter – is great for lifting depression, and it gives a burst of vitamin D to your body. It also keeps the blue off, so you don't have that 'minty-green' winter complexion.. So much misinformation. I watched a friend nearly die from a lack of calcium (she malabsorbs vitamins and minerals and had stopped taking supplements). Now that she is taking the correct amounts of Calcium and D, she is back to being a healthy, vibrant human being. This article is crap. I agree, this study is crap. Yet another nutcase study. Yeah, but snurfles, not everyone mal-absorbs nutrients. For the *majority* of women who are NOT dealing with such an issue, supplements give you nutrient-laden pee is all. Supplements are crap. I stopped all of them, including calcium, D, fish oil, all of them and I have never been healthier. I am post-menopausal and my bones and health have become better and better because of diet and exercise and outdoor activity. You absorb vitamins and minerals better the natural way, most supplements just go through your system. Weight training and exercise is the ticket for strong bones. and when I say 'weight' I mean WEIGHT. None of this sitting on a weight machine pushing a single 10-pound weight with your legs.. Opt for 150 pounds to start and go from there (I'm at 275 and counting) It'll firm those trouble areas of the thighs, help maintain bone density and keep your heart working. The notion that you can 'take a pill' and magically sort your health (or lack thereof) issues is laughable and finally the USPSTF is looking hard and fast at the *scientific* data and results. We need to move beyond the drug and supplement makers so-called 'science' which is based not so much on reality, but on generating sales, and into the scientific and results-oriented world of What Actually Works. It will take some time for the old advertising-based 'beliefs' to fade, but this is a step in the right direction. Get thee to the gym and lift weights ladies! Don't go light because you think you'll look like a man. You won't unless you take steroids, so no fear of pumping iron, okay? I do and feel GREAT and can take a tumble and crash (off my bike, I trail-ride a lot and do crazy things that kids usually try) and other than bruises and my pride, am fine with it – and YES, I'm post-menopausal. Now all we will hear on the stupid news tonight is this ridiculous study. I've said it before, and will say it again, these groups are doing this to get themselves publicity. Say the most ridiculous opposite thing just so they can get attention. Diane Sawyer and her on air "doctor" will talk about what big news this is. They are all idiots. Next study out, vegetables will be bad for you, and Twinkies will be healthy. This reminds me of the HRT study which said that taking hormone replacement raises the odds for getting breast cancer in women. They didn't mention, at first anyway, that the study was conducted using only Premarin and Prempro, which are derived from horse urine....which means that some fifty thousand horses, in Canada, are kept pregnant....God knows what happens to the male colts. It's sick, but, anyway, the study ignored hormone replacement from soy or wild yams. Notice this study refers to "Vitamin D", not Vitamin D3 which is the one that we've been told over and over again we tend to be low on as we get older. I shall ignore this one, too, and wait for them to hopefully correct themselves someday. As for taking or not taking nutrients in pill form, if your diet is not filled with fresh vegetables, fruits, moderate amounts of lean meats, raw nuts and seeds, whole grains, etc., i.e. if you're eating in fast food restaurants and consuming a lot of processed foods, vitamin supplements, in my opinion, would be a very good idea for you! Personally, I have seen my husband take Vitamin C and it actually relieved his post-nasal drip so he's not coughing continuously during alergy season and progressing into severe bronchitis. Then, with regard to Vitamin D, it is a sure cure for depression during the winter months. Also, my daughter was actually hearing noises and it turned out to be a potassium difficiency – eat a banana each day and you'll keep the crazy voices away. It's said to say that we eat so many empty calories each day due to foods with poor nutritional value. The pharmaceuticals are loving this type of article. For what would normally cost $50 a pill from them (with fatal side effects) is costing us pennies for the vitamin supplements. I had low D and high calcium in my blood. I was in terrible shape for a long long time. Awful pain, gaining weight, etc. etc. After being told by a sleep doctor I needed a man in my bed and a shrink I was depressed, I had a bone density test and was asked if I had been in a car wreck, which I had not. I had a parathyroid tumor. The bone people did not diagnose me, they wanted me to take expensive shots. They did tell me about the parathyroid. So I looked it up on the internet, which of course doctors hate. I diagnosed myself and was correct. After going to Houston to see the specialist, it was confirmed and removed. Great doctors, minimally invasive procedure. I opened my eyes after the operation and that weird awful crazy electrical type pain was gone. It was like a miracle. I lost two inches in height and will never get it back, but I feel so much better. I still have pain from the compression fractures in my back and will have to figure out what to do about that, but the weight is coming off, over all the quality of my life is much much better. It has only been six months now and I do take a prescription vitamin D once a month as well as calcium supplements at night. They will retest blood and bone density when it has been a year. After reading this, I do not know what to do. I do know that had I taken the treatment for my bones as advised after the bone density test, it would have caused strokes or seizures. That doctor was literally drooling over my "good" insurance. They talked about that more than anything else. Thank god for M.D. Anderson. They are allowing my body time to correct itself before prescribing those shots and monthly pill things that are on the market now. M.D. Anderson said I probably had that tumor 8 to 10 years. My local doctors just kept telling me that I was getting old and fat. Argh! However, in their defense, the blood test that measures D has only recently been developed. The D, calcium and PHT (the real culprit) is what is at play here. I still don't understand it. I am a little bitter however. Years and years of being told I was depressed and fat. Be careful people. There is so much we do not understand. My mother had severe osteoporosis and lost 4 1/2 inches of height in the last 15 years of her life. A fall in 1996 left her essentially bedridden until she died in 1998 at the age of 78, and I am absolutely determined to not suffer a similar fate. I had osteopenia in 2006 (DEXA scan). Right after that scan, I began taking bioidentical hormones (progesterone and testosterone) along with 10,000 IUs Vitamin D (my level is optimal at 70 ng/ml, just had my blood test last week), weight training exercise (I use light weights at home and weight machines at the gym). A repeat DEXA in 2009 showed not only do I no longer have osteopenia, my bones are comfortably in the normal range. I will NEVER take the bone density drugs, and my doctors fully support my choice. My primary care/hormone physician told me 9 years ago that calcium was not what builds bone strength, testosterone/Vitamin D (the RDA of 400 IUs daily is absurd) does. The hormone optimization has cured my hot flashes, restless leg syndrome, acid reflux and seasonal allergies, gotten me off seven medications, and besides helping to build bone, has also helped to build muscle tissue to stabilize my back (I have four disrupted discs from a long ago car accident). Testosterone also helps with cardiac health, as the heart is a muscle. I have more energy and focus than at any time in my adult life. I would far rather be (bioidentically) hormonally optimized than take a handful of toxic medications. I travel from NC to Southern CA to be a patient at Hormonal Health and Aging in Rancho Mirage and it's among the best decisions I have ever made. I know I am doing what is healthiest for me. Best wishes to all for hormonal health. Vitamin C is a cofactor in at least eight enzymatic reactions, including several collagen synthesis reactions that, when dysfunctional, cause the most severe symptoms of scurvy...-." Yes, I am aware D can be toxic in most cases. But the body can use D3 as it is the most absorbed. You don't get all your D from the sun. You need supplementation. Always see your doctor before taking any form of supplements. I don't know why they are doing research on this... It's already been proven that vitamin K2 is necessary to be coupled with calcium and vitamin D to take it to the right places in the body. All this added calcium without its K2 partner causes calcifications/calcium deposits all over the body leading to increased heart attack risks, joint problems, kidney stones, and the list goes on and on and on. If you're going to take calcium supplements you've GOT to take calcium CITRATE plus K2 along with it; K2 makes calcium go only where it belongs. And if you really want to make it work right, take your magnesium & D3 with calcium citrate and K2 all at the same time (with a good meal that has some fat in it). Otherwise you are wasting your time, money, and increasing health risks. Cheers! Vitamin D is fundamental for solid bones, since it enables the body to utilize calcium from the eating routine. Customarily, vitamin D lack has been related with rickets, an ailment in which the bone tissue doesn't appropriately mineralize, prompting delicate bones and skeletal distortions. Toxicity from vitamin D is mediated by altering calcium metabolism, which is potentially lethal. Vitamin D should be taken daily, with meals or a source of fat, like fish oil.